Gut Yom Tov! Gut Yom Tov! Leshana Tovah Belimud HaChasidus ve Darchei HaChasidus, Tikosaivu VeTichosaimu! Today, Yud Tes Kislev, “The Rosh Hashanah of Chassidus,” marks 219 years since the release of the Alter Rebbe, R. Schneur Zalman of Liadi, founder of Chasidus Chabad, from prison in the year 5559 (1798). 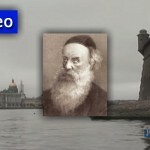 This year also marks 205 years since the Alter Rebbe’s Histalkus. In honor of this auspicious day, which is referred to by Chasidim as the “Holiday of Holidays,” Farbrengens are being held around the world! The 19th and 20th of Kislev are the Rosh HaShanah of Chassidus. The 19th of Kislev is the yahrzeit of our saintly master, R. DovBer, the Maggid of Mezritch, who [as successor to the Baal Shem Tov] was the mentor of the second generation of the chassidic movement – from 5521 (1761) until his passing on the third day of the week of Parshas Vayeishev, Yud-Tes Kislev, 5533 (1772). His resting place is in Anipoli. R. Shneur Zalman [of Liadi, author of the Tanya], known as the Alter Rebbe, founder and first leader of the Chabad chassidic movement from 5533 (1772) until [his passing on the 24th of Teves in] 5573 (1812), was released from his first imprisonment on the 19th of Kislev, late in the afternoon of the third day of the week of Parshas Vayeishev, 5559 (1798). From a letter of the Rebbe Rashab: “Yud-Tes Kislev,…the festival on which ‘He redeemed our soul in peace,’ and the light and vitality of our souls were given to us, is the New Year for Chassidus – which our saintly forebears, [the Rebbeim of their respective generations,] have bequeathed to us – i.e., the teachings of the Baal Shem Tov. One does not say Tachanun on the 19th or 20th of Kislev, nor at the Minchah that precedes the 19th of Kislev. ”It is customary for chassidim to immerse in a mikveh before Shacharis on the 19th of Kislev, in keeping with the practice handed down by the earliest chassidim in the name of the Baal Shem Tov – that with the approach of Shabbos and Yom-Tov, and on Shabbos and Yom-Tov mornings, one immerses in a mikveh. The Rebbe Rashab used to make an appeal for charitable purposes during the farbrengen of Yud-Tes Kislev. Those who belong to a community which, for whatever reason, is “too small” to cope with the entire Talmud, customarily participate in the distribution of tractates that is arranged by the Machne Israel organization in the beis midrash of the Rebbe Shlita. On Yud-Tes Kislev one recommences the annual cycle of daily readings in Tanya, as divided by the Rebbe Rayatz. “The practice has become widespread to hold the main farbrengen of Yud-Tes Kislev on the eve of the 20th, because the Alter Rebbe was released from prison on the 19th at Minchah time, and for the following three hours he found himself in the home of an antagonist to Chassidism, where he suffered spiritual anguish. ”In many places, nevertheless, people foregather for a farbrengen on the eve of the 19th as well – and may chassidic blessings light upon them. 2. all those interested can meet at one location, for ‘In a multitude of people is the King’s glory.' Such a farbrengen should be steered by the venerable elders and the men of stature within the community. ”Abundant quantity or superior quality? Their relative merits are the subject of a classic debate. For comparable cases see: Shabbos 127a; Megillah 3a (in Tosafos, s.v. mevatlin besofo); Avos 3:15 hakol lefi hama’aseh), and see Peirush HaMishnayos there); Iggeres HaKodesh, Epistle 21; and other sources. These are obviously not exact parallels to our case, but space does not permit further elaboration. 598. 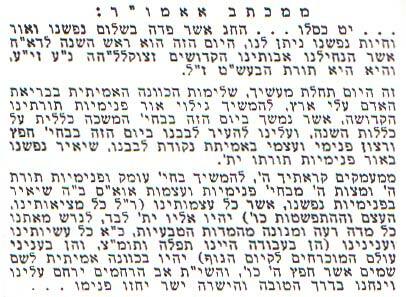 A facsimile of the letter of the Rebbe Rashab that discusses Yud-Tes Kislev as the Rosh HaShanah of Chassidus is reproduced in Kuntreis U’Maayan (Heb. edition only), p. 17 [and translated below]; the background to its first appearance is described in an extract from the Diary of the Rebbe Rayatz, op. cit., pp. 15-18; the above-quoted festive greeting appears in HaYom Yom (p. 113), which also reproduces the text of the letter (p. 4). 600. HaYom Yom, p. 4. See Megillas Yud-Tes Kislev; the sichos of the Rebbe Rashab in Toras Shalom; the sichos of the Rebbe Rayatz and of the Rebbe Shlita on the occasion of each year’s Yud-Tes Kislev; Kuntreis Limud HaChassidus, ch. 6ff. ; Beis Rebbe, Part I; Sefer HaMaasar VehaGeulah; and other sources, [including, in English: The Arrest and Liberation of Rabbi Shneur Zalman of Liadi (Kehot, N.Y., 1964), a translation by R. Jacob Immanuel Schochet of the Hebrew original by R. Avraham Chanoch Glitzenstein; R. Nissan Mindel, Rabbi Schneur Zalman of Liadi (Kehot, N.Y., 1971)]. 603. HaYom Yom, p. 4. 607. This sentence is quoted and expounded at length in Likkutei Sichos, Vol. IV, p. 1252. 608. [This phrase is borrowed from the Mussaf prayers of Rosh HaShanah; Machzor, p. 135.] See the maamar beginning Zeh HaYom, 5710 (in Sefer HaMaamarim 5710). 609. From a sichah of Yud-Tes Kislev, 5707 (Sefer HaMaamarim 5711, p. 145). 610. Sefer HaSichos 5702, p. 19. 612. Sefer HaSichos: Toras Shalom, p. 243. 613. From the year 5663 (1902) onwards, because of lack of time on Yud-Tes Kislev, the distribution of the tractates [in the original: chalukas HaShas] in Lubavitch was carried out on the 24th of Teves, the yahrzeit of the Alter Rebbe. In 5713 (1952), fifty years later, the Rebbe Shlita restored the custom in various places to its original date, Yud-Tes Kislev.